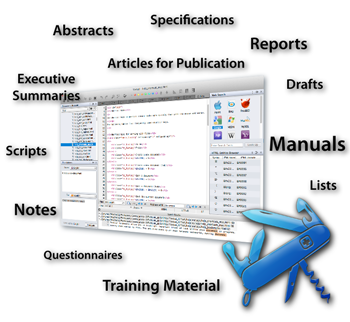 What is new in Textual 4? Textual is completely new from the ground up and combines all well-liked features with lots of great new functionalities to every part of Textual. 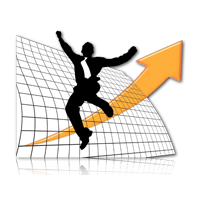 Working steps that previously had to be done through various programs, now find their way into one central application. Here are some of the most important items added or improved in Textual 4. The power to get your job done. 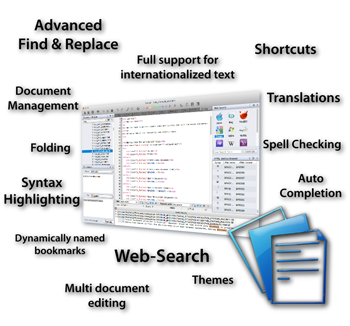 In addition to being the most powerful text editor for Mac, Texual 4 now provides an unique set of tools, such as document management, bookmarks, find in files and direct online searches with one click, which all together bring you an unmatched user experience. Besides all fundamental text editing operations you can now seamlessly organize your documents, quickly find important content even in large files, leave comments in your writing and keep your fingers on the keyboard by using keyboard shortcuts. Textual 4 delivers now several options for maximizing the editing space for any screen size. The standard Textual environment balances the main elements of the user interface, the text editors and the additional tools for managing documents, search results, etc. But when you’re looking for some elbow room while editing text, you can hide any panel without having to manually disable each tool, and show them again if you really need them. This help you work without distractions, structure your thoughts, and get your done in less time. If you don't like white screens or colorful syntax highlighting, switch the editor theme. You can add folder, add file, rename or trash file easily with the new document browser. Textual supports over 200 coding languages by default, including syntax highlighting, folding and auto completion. Quickly find the content you need even in multiple documents. Directly look up unknown terms by using popular search engines and knowledge bases. The insert menu provides access to several time saving items for inserting HTML and PHP elements. If just getting the job done is work enough, the last thing you need is to waste time having to search for and learn another program over and over again. 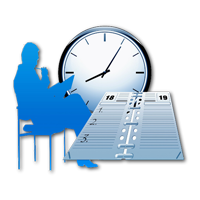 An application should make it possible to sit down and start a task right away. And the best, you can use the same program for nearly everything. That's why Textual is so popular. While aiming at simplicity and ease of use, Textual is a powerful general-purpose text editor - packed with features. Textual puts you back in control, improves the process of writing, and supports you to focus on what really matters: Your content, your business. Plain text is a great format to use because, it can be read by any computer or device, it is future proof, since computers will always be able to read it, it can be synced to all your devices and it can be converted to virtually any format. With Textual you get your Swiss Army Knife to edit any kind of text-based files. Once Textual launches, you can start right away. Textual was made to combine a standard, easy to use, graphical user interface with the thorough functionality and stability required by users who work with text eight hours a day. 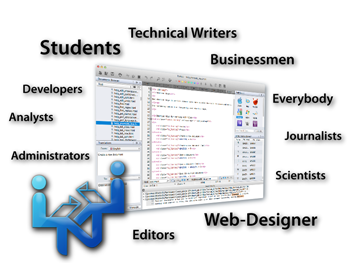 It provides intensive support for development in a wide variety of languages, text processors, and other features, but at the same time it can be used productively by just about anyone who needs to edit text, like System Administrators, Analysts, Businessmen, Developers, Editors, Engineers, Everybody, Journalists, Scientists, Software Developers, Students, Technical Writers or Web-Designer. Textual focuses on professional features that popular word processors generally do not offer, including document management, syntax highlighting, code folding, advanced find and replace operations, auto completion, spell checker and many more useful functions, helping you to make your tasks more efficiently and easier. Textual has a lot of functionality that makes writing and editing text files more convenient and more efficiently for you. A lot of this does not sound very impressive or even works behind the scenes, but you will surely appreciate it when you need it. Show and hide white spaces, space characters appear as small centered dots and tab characters as light arrows pointing to the right. Configurable sidebars: The sidebars contain useful tools, such as Web Search, Documents Browser, Scratchpad and HTML Entities Browser. Syntax highlighting is an important strategy to improve the readability of context and text. You can easily ignore so large sections of content, depending on what one desires. From ABAP to ZSH, Textual supports over 200 coding languages by default. The following table shows all of the file types / coding languages that are directly supported by Textual, and what other core features, such as code folding, syntax highlighting or code completion are available for each type. The spell checher flags words in a document that may not be spelled correctly. You can choose the right substitution for misspelt words using the Check Spelling dialog. Any text file containing data that you open and edit in Textual is displayed using an encoding. Encoding is how the raw data of a file is interpreted and displayed in the editor as readable text, which you then can manipulate using your keyboard. Internet connection required for documentation and other online services. We are pleased to offer jalada Textual at a discount to students and faculty at not-for-profit educational institutions. The discount is 30% on individual products. 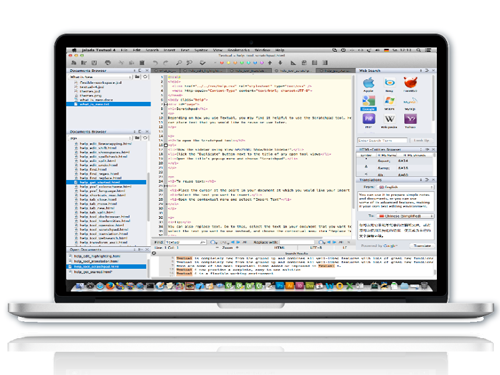 jalada Textual 4 - The text editor for Mac OS X packed with features.